The day after next month's lunar eclipse is a rarer event, the occultation of a 3.7-mag. star by a planet with a thick atmosphere. It will occur around 18h UT visible from the Tasman Sea region, New Zealand, eastern Australia, Fiji just before sunrise, Papua New Guinea, the Caroline Islands, and islands in Micronesia farther north. Probably the best place is New Caledonia, where the event will occur highest (alt. 25 deg.) in a dark sky close to the time of the start of astronomical dawn twilight; the southern South Island of New Zealand is almost as good, and is only a few hundred km north of the predicted southern limit. In Australia, the event will occur at rather low altitude above the horizon, the highest being about 15 deg. in the Gold Coast region of southeastern Queensland. Venus will be 45 deg. from the Sun; its 19.3” disk will be 61% sunlit and a central occultation is predicted to last 7.0 minutes. Only the dark-side reappearance will be observable; the star will become lost in Venus’ dazzlingly bright disk before the real disappearance occurs. The star lambda Aquarii (= ZC 3xxx = HIP 112961 = SAO 146362) is a red giant spectral type M0 star with a diameter of 8 mas, 24 times the diffraction fringe spacing, so Fresnel diffraction will be negligible for this event. The overview figure of the event generated by Occult, computed by Dave Herald, is at http://www.asteroidoccultation.com/observations/NA/2014_04_16%20Venus.jpg . 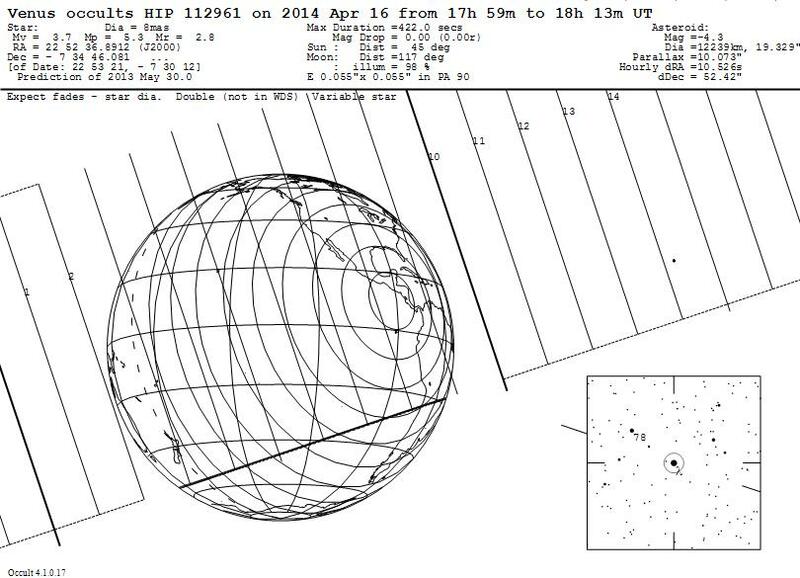 I believe that this is the brightest star occulted by Venus (and by any major planet) since Venus occulted 2.1-mag. Nunki (sigma Sagittarii) as seen from eastern Africa in November 1981. The next occultations of bright stars by Venus will be of pi Sagittarii in 2035 and of Regulus on 2044 October 1. Before the space age, astronomers would have flocked to the Tasman/Micronesia region to observe this event, to learn more about Venus’ atmosphere, but now that space probes have descended through the atmosphere, there is not nearly as much interest now, it is more a curious event. Nevertheless, observers in the region are encouraged to try to observe it. Observers in a narrow strip of ocean just north of the equator will have a central occultation, and possibly a central flash, with a ring of light briefly forming around Venus’ whole disk. During night, this strip includes no land except for the island of Butaritari (and maybe its satellite island Makin) at lat. 3.0 deg. N., long. 172.9 deg. E. At that island, Venus’ altitude will be 34 deg. with the Sun 6 deg. below the horizon. Although the twilight will be strong, a telescope may possibly see the central flash phenomenon. Looking at the aerial view, Butaritari has over 100 buildings and an air field; Makin has its own separate air field. Maps showing the central zone, and an interactive Google map of it (including the southern limit as well, but ignore the part east of the International Date Line, where the event occurs after sunrise) can be found in a box on the upper right side of Brad Timerson’s North America page (although this event is visible from North America only in daylight; it might be observed with large telescopes in the infrared) at http://www.asteroidoccultation.com/observations/NA/ .